It's been quite weird with UK weather recently. It's supposed to be summer but, the weather could pass off as late autumn or early winter. Irregardless of that, it's time to show summer clothing. I'm back earlier this week for a very special post because I'm very excited to present you guys one of my ultimate favourite brands – Ralph Lauren. But, before we get to the nitty gritty, I'm very grateful because my other fellow group members from S4F agreed to showcase and be featured for this post! So, a big thank you to Amin, Hirzie and Mustaqim for helping me out. Three Ralph Lauren Big Pony Polo and A Dual Match Pony Polo. One of the primary reasons for my love for Polo Ralph Lauren is their vibrant colours and each colour gives an entirely different look. I have carefully selected two colours that I own, purple and blue and combining it with white and orange that both Amin and Mustaqim owns, because of their bright colours, which is perfect for summer. 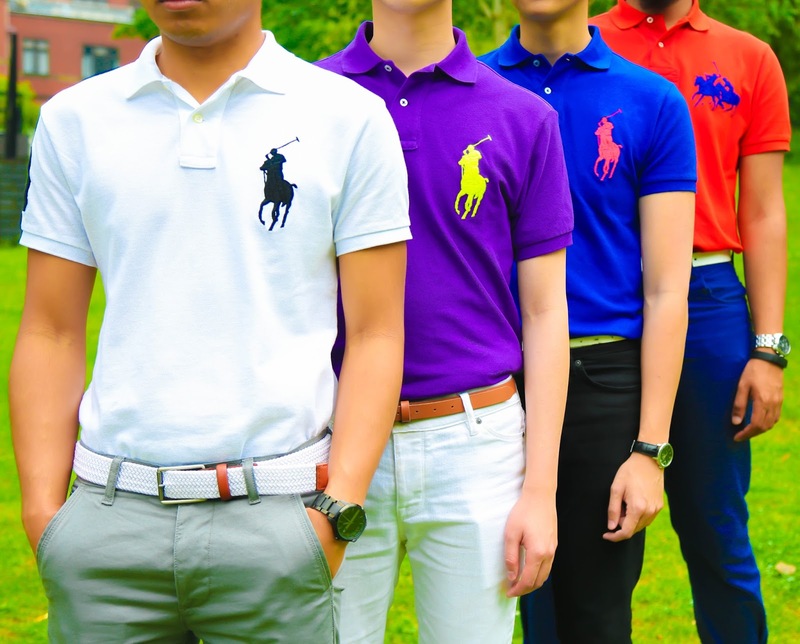 I am also a huge fan of their big pony and dual match polo because it somehow makes it more distinct and their colours complement the colour of the polo shirts. White, Purple, Blue and Orange. 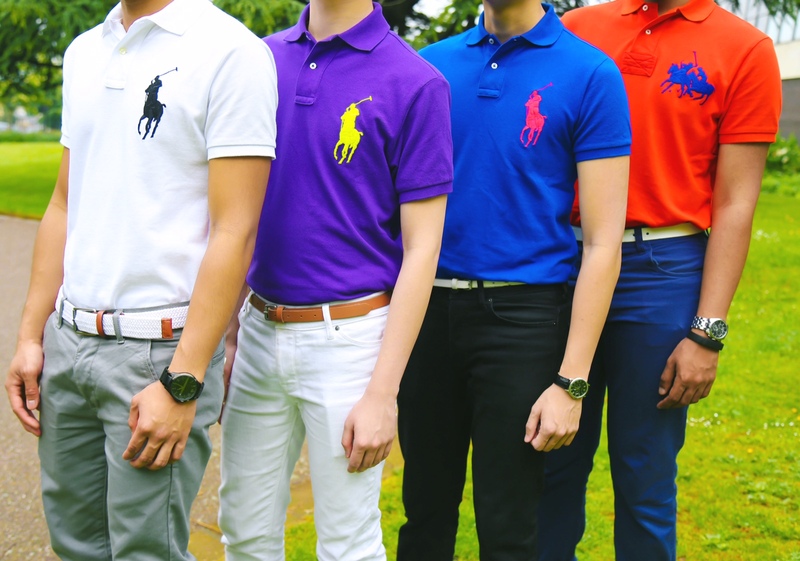 I'll begin with the White and Purple Polo. It'll be shown by myself and Amin Nordin. Amin has photographed me before, if you guys have seen my "Elf" and "The Snow Prince" posts, it was done by him! So, it's quite cool for us to be in the same photos together, rather than Amin being behind the camera. Once I found out Amin got the white polo, right off the bat, I knew it must be a monochromatic outfit. Although white polo goes with anything but I personally think if you add it with a light grey chinos, it will produce such a classic look. It's a good outfit for those who are not fond of bright colours. It is also accessorised with a white belt from Penguin and white shoes from Burberry (it was featured from the double trouble post). An alternative look would be with black coloured trousers to follow the black pony logo. Overall, as the colours are neutral, it is an outfit that will most likely be approved by most, if not everybody. 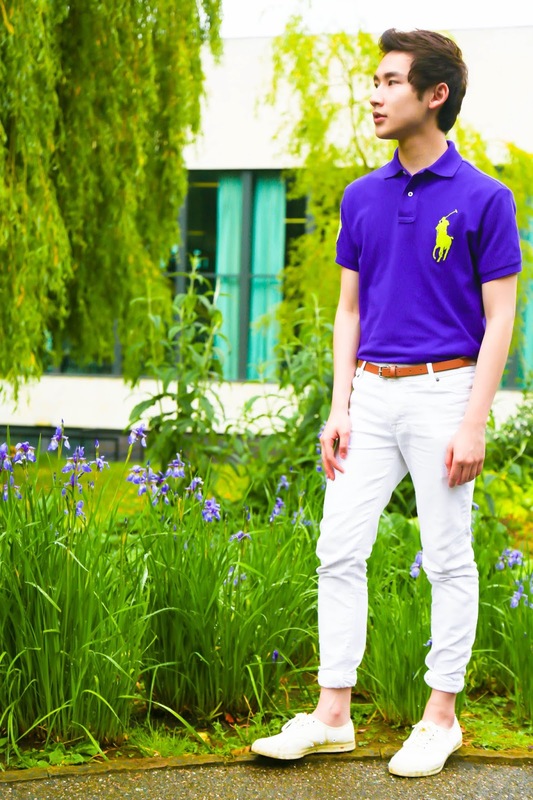 As for the purple polo, I've decided to wear my white jeans to go along with it. I was sort reminded of Yahoo inc, where it consisted of having white and purple in their logo. By wearing white jeans, brown or tanned belt is the only colour that would fit with the whole outfit. As for the shoes, it's an off white coloured plimsoll which was featured before in "Elf" and "The Magic of Coloured Pants." Overall, it gives a calm look. I actually have different colours in mind to go with the purple polo initially. It definitely goes well with yellow coloured pants, but with that, you have to displace the tanned belt with a white belt, it would produce another look. Another one, if you are up for a bolder look, a green coloured pants can provide this. Second, the orange and blue polo. Both are bright colours that complement one another. It's showcased by Hirzie and Mustaqim. Hirzie was featured previously in the "Double Trouble" post, so it's nice to have him back. On the other side, it's Mustaqim's first time! There's always a first for everything right? 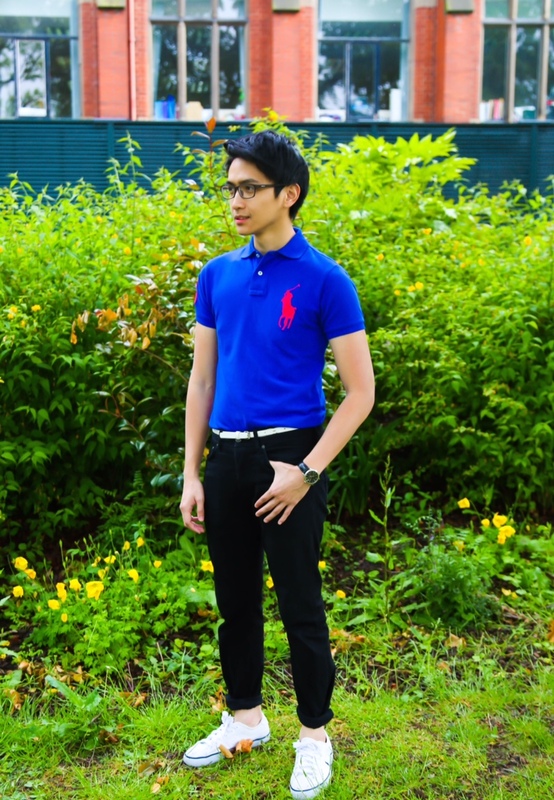 Interestingly, the blue polo was supposed to be worn by myself with the white jeans! But, in the end I decided to produce another calm look where it consists of blue and black. We all know that blue and black just complements one another very well. I've also added the skinny white belt to make the outfit pop even more, subsequently, white shoes were chosen too. Definitely good for guys who find light coloured pants a bit weird to wear. A much more casual look can be worn with shorts, I think a lot of colours can go well with it, ranging from yellow to green. But, I personally would go with white or black, and I think pink will look nice too. Last but not least, the burning orange polo. It's the only polo shirt that has a dual match pony logo for this post. It is also the only outfit that the pants follows correspondingly to the colour of the logo. 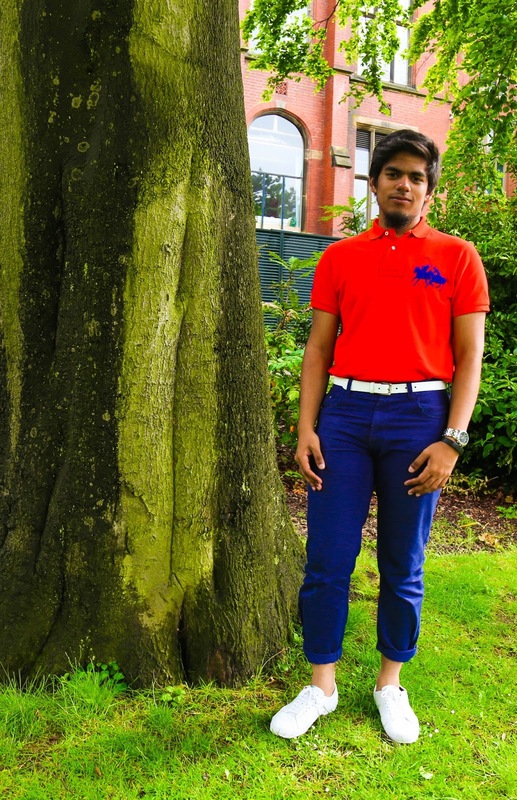 The orange polo with the blue pants was accessorised with a white belt and white shoes. This is the boldest outfit when compared to the rest, so it screams louder than the rest. It's definitely a polarising head-turner outfit to wear. Some will like it, some will dislike it. Blue and Orange are complementary colours. Same case with green and pink, etc. Simple golden rule with the colour wheel, just look at the wheel and rotate the line to each colour, you'll find which colour goes well with one another. Unless you're wearing white coloured pants, then you would want to avoid wearing a white belt because it would be useless as you can see if you're wearing a belt or not (unless that's the look you're going for). But, I think both white shoes and white belt are universal for coloured outfits. A huge thank you to the other three boys for doing this with me! That's all from me this week. Ramadhan is just in two days! I am very excited and nervous because I will be fasting for almost 20 hours in the UK, and for the first time, not spending the whole of Ramadhan in Brunei. Possible boy group photo album? Just kidding. Here's a cover of "Demons" by Imagine Dragons from the four of us while wearing our outfits featuring the Ralph Lauren Polos. Stay tuned for Alia, next week! With that, I'll wish you guys "Selamat Berpuasa."